The Fiserv Forum was originally constructed as a replacement for the previous home of the Milwaukee Bucks, the BMO Harris Bradley Center. 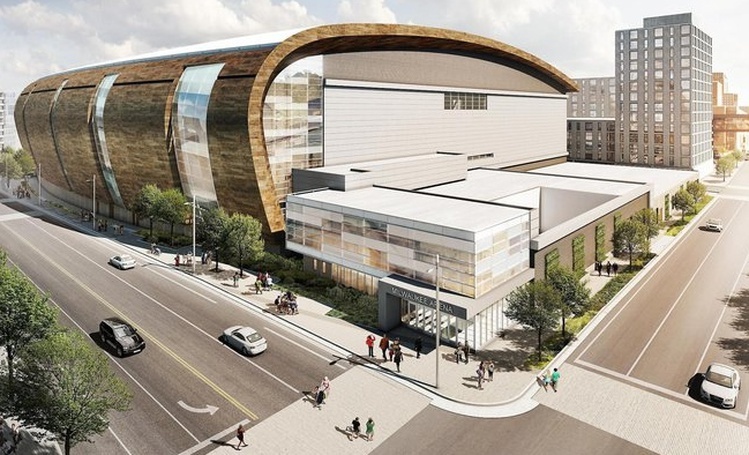 The suggestion to build a new arena was put forward by former Bucks owner and former U.S. Senator Herb Kohl. Many obstacles were overcome in order to create this new arena. Initial discussion over whether it should be publicly funded was eventually dropped, and after construction had begun, the NBA commissioner Adam Silver visited the arena, deeming it unsuitable for the NBA as it was short by a few thousand square feet, and lacking in certain amenities. But the team behind the venue pushed through and made all the necessary changes, and the venue was fully constructed, certified, and named the Fiserv Forum. The official groundbreaking of the arena occurred during the 2nd annual Bucks Block Party on June 18, 2016. We are excited for this unprecedented opportunity to elevate and further differentiate our brand in support of our purpose of delivering value and excellence to our clients every day,” said Jeff Yabuki, the CEO and President of Fiserv President. The brand-new venue has now been fully constructed and was opened with a spectacular inauguration concert with The Killers and Violent Femmes! The list of concerts for its first official year of opening looks nothing short of incredible, with names including Kevin Hart, Twenty One Pilots, Metallica, Foo Fighters, Fleetwood Mac, Elton John, P!nk and Carrie Underwood, just to name a few!! For ticket information and information on our ticket provider please see the Fiserv Forum tickets page.